Garlic mustard is a native winter annual, biennial or monocarpic perennial abundant in damp shaded areas, common in hedgerows and at the edge of woods. Although found in hedge bottoms it does not spread far into arable fields and is largely absent from agricultural land. It is common on heavy soils but is most abundant on phosphate rich and calcareous soils, particularly chalks. Seedling density can be extremely high. It is considered invasive because it can quickly become dominant in understorey vegetation, eliminating other species. Plants exhibit considerable plasticity in different habitats. 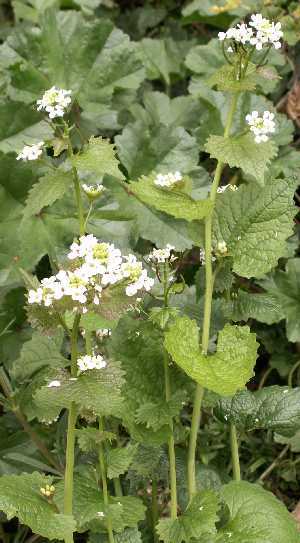 Garlic mustard is edible and has been used as a salad green. It has a characteristic odour of garlic and if eaten by cows it will taint their milk. It is a food plant of the green-veined white butterfly (Pieris napi) and a site for egg laying. Garlic mustard seed is important in the diet of many farmland birds. The flowers open from April to June and peak flowering occurs in mid-May. Midges and bees pollinate the flowers, however, the flowers are self-compatible and may self-pollinate automatically. Seeds are shed from July onward. Each seedpod contains 10-20 seeds. Seed development varies within and among pods. When resources are limited the seeds nearest the base of an individual pod and the pods nearest the base of the fruiting stem are more likely to achieve maturity. Seed size is highly variable both between and within populations, and between and within individuals, and even within pods. Seed size reduces with increasing distance from the main stem. Smaller seeds germinate earlier but produce their first leaf later than larger seeds. However, seedlings from smaller seeds often grow taller. Seed dormancy is broken by chilling. Seedlings emerge between January and April and gradually form a long taproot. Garlic mustard survives winter as a rosette of leaves. It may regenerate from adventitious buds on the roots. Garlic mustard seeds can remain dormant for 18 months and are moderately persistent in soil. The plant can accumulate a soil seedbank and seedlings establish rapidly following soil disturbance. Garlic mustard can persist as adventitious buds on the roots. Grooves along the seed coat trap air and enable the seed to float on water. Regular trimming along hedgerows and banks will weaken the weed. Plants on the field margin should be cut down and those that encroach onto arable land hoed out. The plants should be removed before seed is set. Cutting at ground level is effective but needs repeating over successive years to exhaust the seedbank. Garlic mustard is usually absent from grazed and trampled sites. Plants that are mown or trampled may throw up new flowering shoots. Lateral flower shoots may form on cut stem bases. Adventitious buds are said to form occasionally on the roots of damaged shoots.